“To create these paintings I align myself with the expression, awareness and energy of Love and Truth”. Eva Maria Pacheco Ricote is a PhD researcher in Fine Arts at the University of Barcelona. She got a financial aid to study at the Fine Art Faculty University of Athens in Greece. 15 years ago, as a post-graduate student from National Autonomic University of Mexico, she was deepening her paintings and her search for herself. Her questions about a way to calm the mind, the thoughts and the emotions led her to meditating at the Brahma Kumaris center and Raja Yoga. She travelled to India in 2003 to visit the center in Mt. Abu. The visit had a strong impact on her life. In 2010 she came to live in New Delhi where she’s been living for six years and works at Instituto Cervantes as a Spanish teacher and cultural manager. 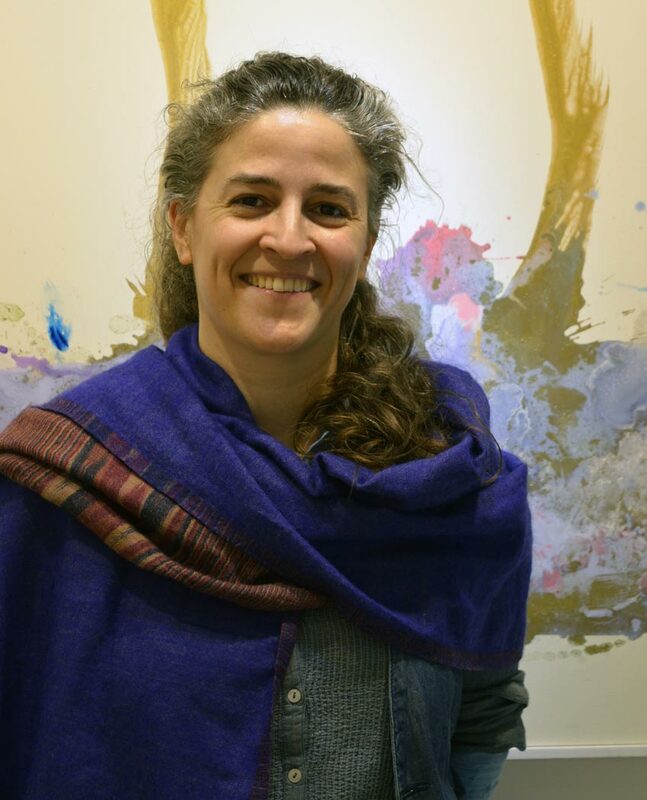 In Barcelona, as a PhD in fine art, Eva Maria Pacheco Ricote worked on the connection between the spiritual aspect of being and painting as a creation. Her line of investigation is the process of spiritual development through art and meditation. Paintings are the mirrors of this inner soul and development. In her process of creation, the heart is conducting the composition, the mind letting the intuition and feeling directing her hands. When everything is balanced, the sensibility of the composition, colors, materials and forms have no resistance in the physical matter of the canvas. The viewers will identify themselves with the images, as they can resonate with them, because Eva’s paintings are part of the original and universal Love and Truth virtues. Eva Maria Pacheco Ricote participated in international events and has been working on cultural programs, films, theaters as art director and painter. Her art has been shown in collective and solo exhibitions in art galleries and art spaces in several cities of the world. 2014, It’s a women world at Asia Fine Art Gallery. Wan Chai. Hong Kong. 1996, Three Women. Gryphon Room. Wayne. Philadelphia, U.S.A.